Upper endoscopy, or EGD, is a powerful diagnostic procedure that Dr. Bharat Pothuri uses to see inside a patient’s upper digestive tract. He uses a thin scope equipped with a tiny light and camera to examine the esophagus, stomach, and upper portion of the small intestine. An EGD helps the team at GastroDoxs chart a course of action for patients experiencing severe digestive discomfort. If you live in Greater Houston, call or schedule an appointment online to learn which screening method is right for you. We are located in Cypress, North Houston, TX. Which conditions are evaluated using upper endoscopy? Upper endoscopy is the diagnostic method of choice for many physicians and is more accurate than an X-ray in identifying abnormal growths that may indicate the presence of cancer. During the EGD, Dr. Pothuri can also take a biopsy, dislodge items stuck in the stomach or esophagus, or dilate narrowed areas in the upper digestive tract. Upper endoscopy is a common, safe, and effective procedure. You need to arrive an hour and a half before your procedure; after you’ve changed into a gown, Dr. Pothuri places and IV to give you pain relief and sedation medications. Once you are resting comfortably, he inserts a mouthpiece and gently advances the scope through your esophagus and stomach, into the upper portion of your intestinal tract. 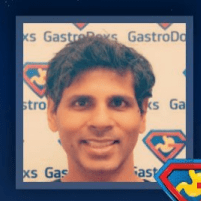 Dr. Pothuri injects small amounts of air, which allows him to see the structures of your digestive system. During the procedure, Dr. Pothuri can address bleeding, remove any polyps, and take a biopsy, if needed. After conducting a full examination, he gently retracts the scope and allows the sedation medication to wear off. What happens after the EGD is complete? As the effects of the sedation wear off, you are closely monitored by the GastroDoxs staff. Once you are awake and alert, you will need someone to drive you home, and you should take it easy for the rest of the day. Driving, working, or engaging in any strenuous activity should be avoided after your upper endoscopy. When the results of your EGD are ready, Dr. Pothuri will talk to you about what he found during the test. He will discuss your treatment options and help you decide how to move forward. You will receive a written report, but it’s also a good idea to bring a trusted friend or family member with you to help you work through your options. Many people come to Dr. Pothuri for an EGD after years of suffering through painful digestive issues. Understanding the causes and treatment options can bring a deep sense of relief and a renewed desire to tackle treatment. Fast and easy online scheduling can help you begin a path toward healthy digestive function. If you’re suffering from digestive discomfort and think an EGD may be right for you, call GastroDoxs or book an appointment online today. We are conveniently located in Greater Houston and look forward to meeting you.